May is Better Sleep Month with the Better Sleep Council’s Get on Top campaign. The Better Sleep Council does not sell or endorse any specific products or brands. The Better Sleep Council’s (BSC) mission is to educate the public on the important connection between sleep and good health – as well as the significant role the sleep system and environment play in getting a good night’s rest. In fulfilling that mission, the BSC engages consumers by creating and promoting innovative messaging through traditional and social media platforms. Did you know that many American's don't get enough quality sleep? Being a mother of two young kids, it is important for me to get the sleep I need in order keep up with my family. Four years ago my husband and I made the decision that we needed to take our sleep more seriously. Instead of going to the store and purchasing the cheapest mattress we could find that wasn't as hard as a rock, we actually sat down and researched which mattress would be best for us. I'm not going to tell you which mattress we purchased because everyone is going to be different and I highly encourage you to do your own research. However, I can say that it was the best decision we ever made. The past four years we have had some of the best sleep. I awake feeling well rested and ready to start the day. I am not as grouchy and have a lot more patience with my kids. When I'm in a better mood, my kids are in a better mood and everyone is happy. So how do you know when it's time to buy a new mattress? A mattress that has been used for five to seven years may no longer provide the comfort and support your body needs. A scientific study conducted at Oklahoma State University echoes this in its findings that participants with mattresses 5 years old – or older – reported significant improvements in sleep quality and comfort when sleeping on a new mattress. Other signs that it’s time for a new mattress can be found in the Better Sleep Guide. What do you do to maintain or care for your mattress? Here are a few tips from the Better Sleep Council to get the most out of your mattress. 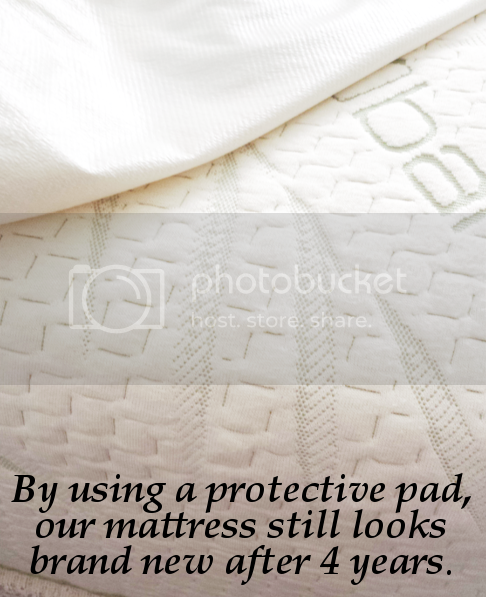 Click here to find more tips on maintaining and caring for your mattress. Chamomile Tea. Chamomile has a natural calming effect and I find that I always have a better nights sleep if I sip a cup before bed. Warm Bath. Baths are relaxing and a great way to relieve stress. You can even add a few essential oils to your bath if you wish. Noise Machine. Noise machines are a great way to relax your mind. They also cancel out outside traffic noise. Routine. Getting into a routine before bed allows your body and mind to prepare for sleep. My routine consists of drinking my chamomile tea, reading, then turn on some noise, and lights out. What do you do in order to get a good nights sleep? How does lack of sleep affect you? Have you made any changes in the bedroom or purchased any products to help you sleep? For more tips on getting a better nights sleep read The Better Sleep Council’s a guide for how to get better sleep. This Memorial Day is the perfect time to shop for a new mattress. Where will you shop for a mattress? How will you decide where to shop? If you would like more information on buying a mattress you can find it here: how to buy a mattress. The Better Sleep Council’s Get on Top Campaign is holding a GIVEAWAY!!! You could win a $50 (USD) VISA gift card. Comment on the blog with your sleeping troubles - How would a new mattress help? I would love to hear your personal sleep stories. Feel free to share any tips on how you manage to get a good nights sleep. My mattress is lumpy. A new mattress would help me get comfortable and sleep through the night. I have trouble sleeping due to back pain and our old mattress makes it worse. A comfortable mattress is very much needed. I have trouble sleeping, I can't get comfortable between the pain in my back and my legs. I think our mattress is wayy too stiff. I need something with a little cushion so I can sleep thru the night! A new mattress would really help with my back pain. I have scoliosis which causes a lot of back pain daily in my lower back as well as the middle/center where your spine is and also between my shoulders where your neck meets your back - it's awful. This is why I rarely sleep on my back. I am always forced to sleep on my side or my stomach because my mattress is just not cushioned enough for my back - it's painful and uncomfortable. I really do need a new mattress, one that is very soft and has a lot of cushion. I think that would help a lot. My mattress is a little bit old and sometimes causes me discomfort when I sleep, Choosing a new mattress with the right cushion and support would definitely help me sleep better. My mattress is very old and quite hard with a dip in the middle despite regular flipping. Thanks to Lupus, Fibro, joint issues, etc. it is impossible for me to get comfy enough to go to sleep. I use a lot of pillows to try and prop myself, but I think a new foam or gel top mattress is the only answer to being able to get some sleep! My husband gets up numerous times every night (and wakes me up often doing so) and constantly complains about needing a new mattress because it’s not cushioned enough and very uneven. Our mattress is easily over 15 years old and a new mattress would let him (and me) get a better sleep! A new mattress would be a big help in letting be feel more comfortable when I go to sleep. I toss and turn a lot trying to get comfortable on my mattress. I can say that it was the best decision we ever made. The past four years we have had some of the best sleep.